2015 seems to be an busy year for Swatch collectors. Earlier this year, we wrote about the Dunkel Collection, the world’s largest private Swatch collection, that was auctioned off by Sotheby’s Hong Kong, this April. The winning bid reached an impressive HK$46.7 million (more than six million USD). Swatch collectors got another chance to put their hands on another exceptional collection, the Schmid & Muller Collection that will go under hammer on November 10, 2015, as a single superlot at the Important Watches auction at Sotheby’s Geneva. 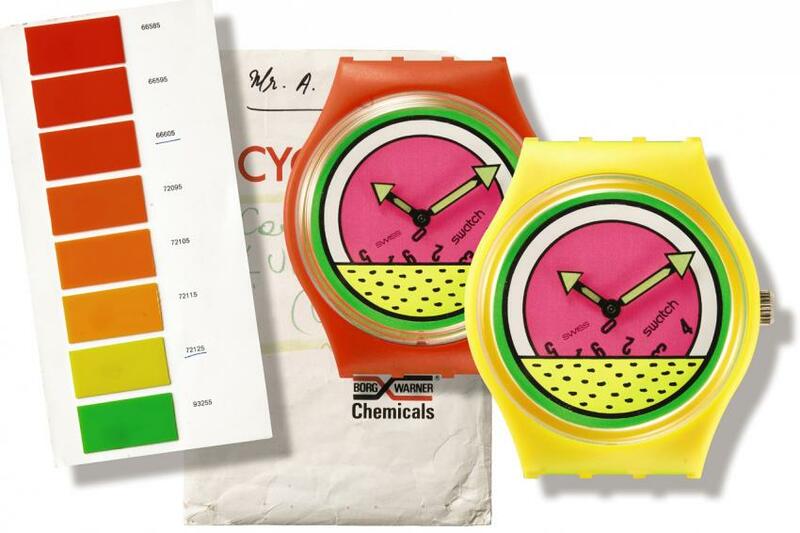 With its 4,000 pieces, including 1000 watches among which there are nearly 380 exceptionally rare prototypes, The Schmid & Muller Collection chronicles the earliest days of Swatch design. Assembled during the 1980s by Marlyse Schmid and Bernard Muller, two designers who played an important role in the artistic development of the Swatch brand. The collection covers a period during which the Swiss watch industry was struggling to reinvent itself. Against this challenging backdrop, a small team of visionaries, working in secret, developed a bold and innovative watch, which would go on to re-popularize non-digital watches thanks to its creative new style and ground-breaking technology. The result of their work was a youthful watch which combined the highest Swiss quality with a new, trail-blazing attitude: Swatch. 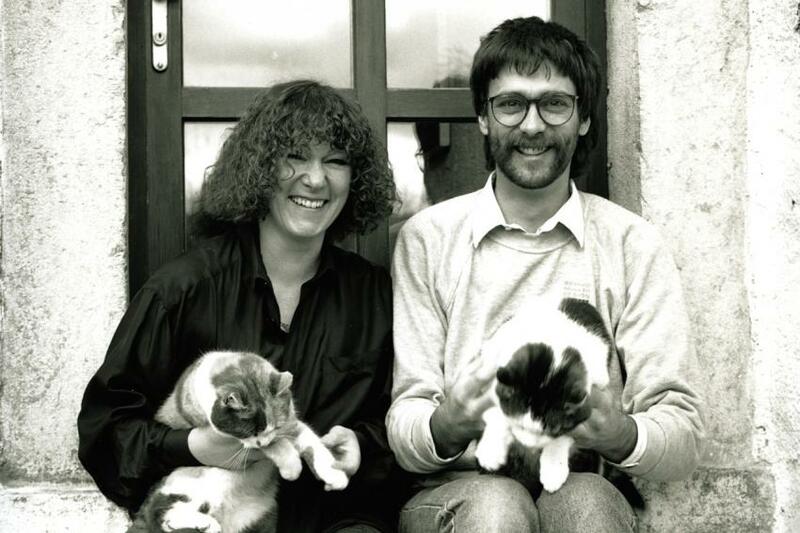 Marlyse Schmid and Bernard Muller were at the creative heart of a secret Swatch development team assembled in October 1981. The duo would be the creative designers of the very earliest Swatch models, developing the watch’s iconic design. 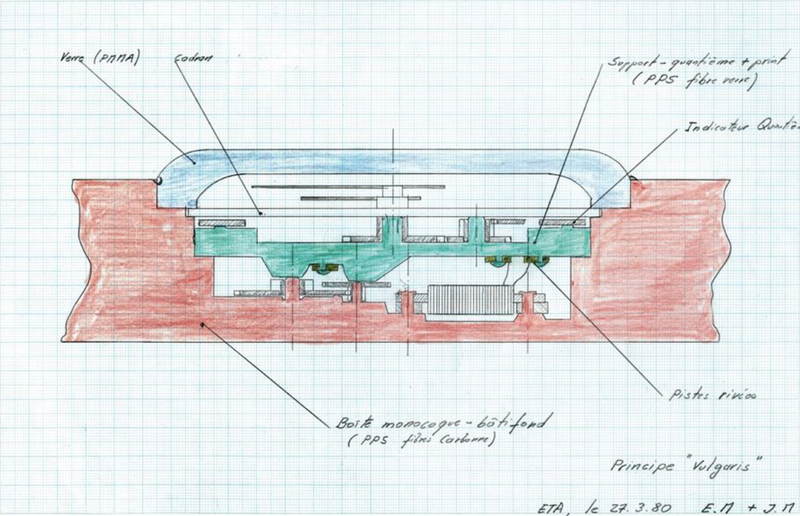 The very first sketch of the ground-breaking Swatch case, named “Vulgaris”. The drawing marks the launch of the whole project on March 27, 1980. Early 1983 saw the birth of “The Original Jelly Fish” (ref. 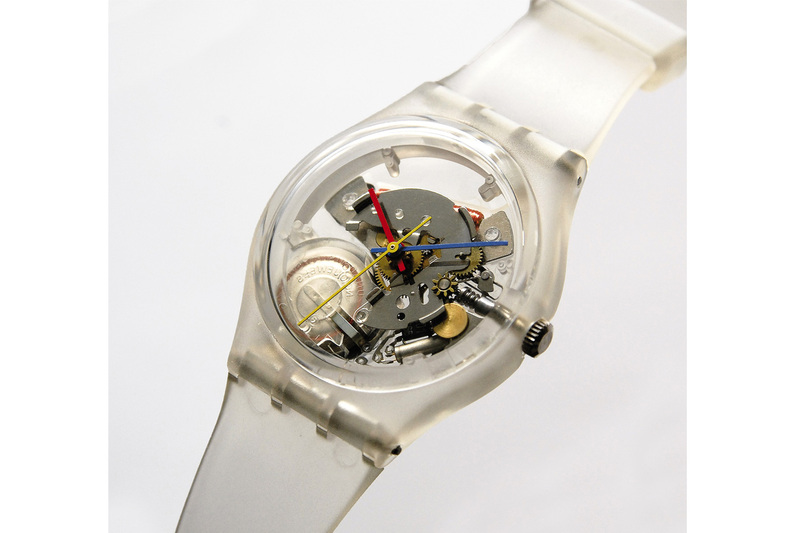 GK100 SP) – the first transparent watch by Swatch. Designed by Marlyse Schmid, it was launched in a limited edition of 200 pieces. This was the first “Special Model” introduced by Swatch. The complex and layered design of this watch was the genesis of a 140-piece edition which confirmed the anti-conformist and artistic will of Swatch creators. Schmid and Muller preserved their correspondence with Kiki Picasso, which charts the creative collaboration between the artist and the design duo. 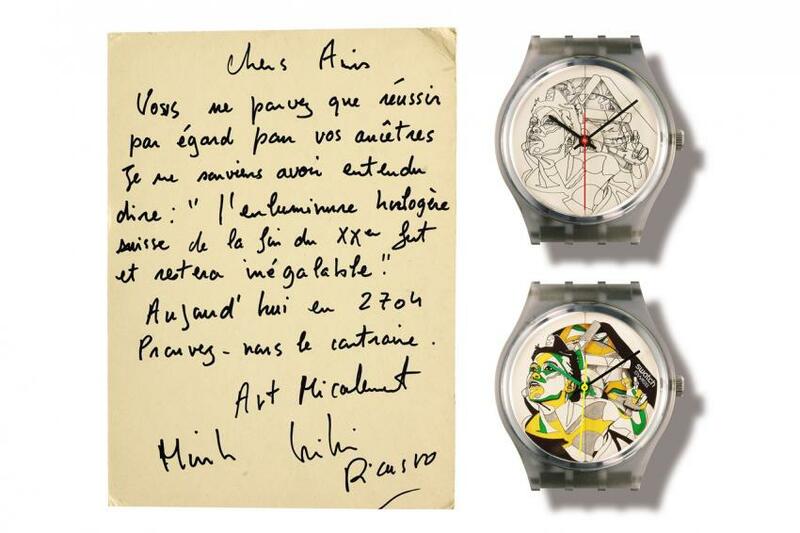 Kiki wrote a letter (pictured above) showing his enthusiasm to the Swatch team, saying with humour: “I heard that Swiss watch enthusiasm at the end of 20th century‘s is and will ever be unbeatable. Today, in 2074, show us they were wrong.” These letters and drawings offer fascinating insight into the way these unique and striking watches were developed in 1984. The Serpent, by American street artist, Keith Haring (1986). – Schmid & Muller Collection. 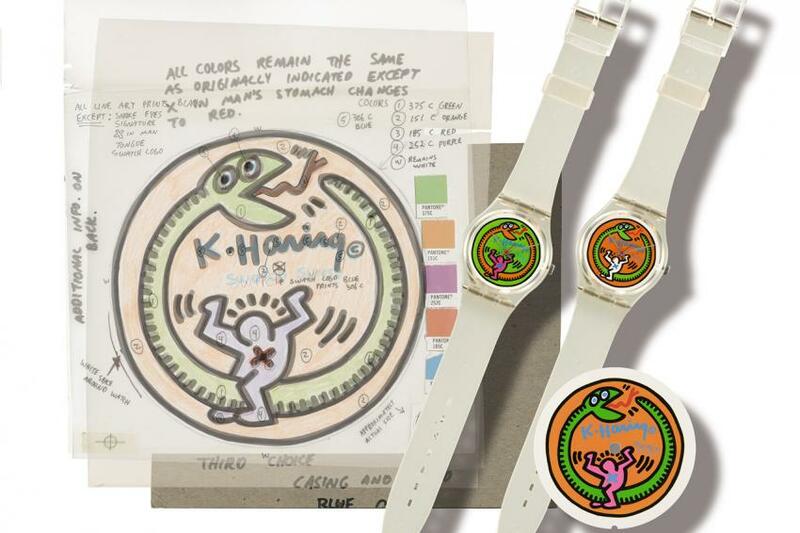 It took Haring two years to come up with the now famous 1986 collection of six different designs including the Serpent. The drawings on the left show the precise instructions of Keith Haring about the possible changes in colours on these dials for the “Serpent” edition. This collection was only available in the USA, making these time pieces even more exceptional and desirable to this day.